Singapore will do its best to discuss all outstanding bilateral issues with Malaysia in a calm, reasonable and focused manner, Foreign Affairs Minister Vivian Balakrishnan told Parliament yesterday. But he warned of "consequences" if other nations embarked on "adventures and antics" against it. Dr Balakrishnan also said he does not expect a quick or smooth resolution to these issues with Malaysia, which include disputes over maritime and airspace boundaries. Last October, Malaysia unilaterally extended the Johor Baru port limits into Singapore's territorial waters off Tuas. It has also objected to the implementation of new landing procedures for Seletar Airport. "Both of these sets of sudden actions upset the status quo that has been in place for many years," Dr Balakrishnan said in his statement, where he set out the facts of each issue and highlighted steps that both sides have taken to find a constructive way forward. "These actions did not bode well for our bilateral relationship. They created the risk of a dangerous downward spiral of measures and counter-measures." On Malaysia's extension of port limits, he said it goes beyond even the territorial sea claims in its 1979 map, which Singapore has rejected consistently. "The inescapable conclusion is that the new Johor Baru port limits transgress into what are indisputably Singapore territorial waters," said the minister, highlighting how Singapore has long exercised sovereignty and patrolled the disputed waters without any protest from Malaysia. He also pointed out that daily intrusions into these waters by Malaysian government vessels since November have continued despite the Malaysian Foreign Affairs Ministry declaring that it would take "all effective measures" to de-escalate the situation on the ground. "These intrusions do not help Malaysia's legal case. All they do is to raise tensions and endanger navigational safety in the area," he said. Dr Balakrishnan and his Malaysian counterpart had agreed last week to form a working group to discuss matters and de-escalate the situation in the waters off Tuas. While Singapore believes that maritime boundary delimitation is best resolved through negotiations, it is prepared to settle disputes via an appropriate international third party dispute settlement procedure if such negotiations fail, he said. Replying to a question from Mr Vikram Nair (Sembawang GRC) on what actions Singapore could take if there were further intrusions into its waters, Dr Balakrishnan said: "We will always take appropriate measures to safeguard our interest, and any country dealing with Singapore must not assume that it is cost-free to embark on any adventures or antics against us. There will be consequences." He also addressed the 1962 Water Agreement, which Malaysia wants to revise. The attorneys-general on both sides had met last month to better understand each other's position on whether Malaysia still had the right to review the price of water, but it was overshadowed by other issues that subsequently arose. They will meet again to continue discussions, he said. The transport ministers from both countries have also agreed to meet later this month for further discussions on the airspace dispute. MPs had filed 14 questions on the disputes with Malaysia, and seven members had supplementary questions for Dr Balakrishnan. Concluding his speech, he said: "The strength of Singapore's diplomacy depends on domestic unity and resilience, and the fact that we cannot be intimidated or bought." This is why Total Defence and investment in the Singapore Armed Forces are so important, he added. As a small state with limited resources, the quest for security and resilience has been "a constant, relentless imperative" since independence, Dr Balakrishnan noted. Countries dealing with Singapore should not take the Republic's consistency, and what some would say predictability, for granted, Foreign Affairs Minister Vivian Balakrishnan said. "We will always take appropriate measures to safeguard our interests. And any country dealing with Singapore must not assume that it is cost-free to embark on any adventures or antics against us. ''There will be consequences,'' he stressed. Speaking in Parliament yesterday on current Singapore-Malaysia tensions over territorial waters and airspace issues, Dr Balakrishnan said it was the reason Singapore postponed a planned meeting between National Development Minister Lawrence Wong and Malaysian Minister for Economic Affairs Azmin Ali, as well as officials on both sides. The Joint Ministerial Committee (JMC) for the development of Iskandar Malaysia was scheduled to meet yesterday. Singapore postponed it after an intrusion by Johor's Menteri Besar Osman Sapian, who had visited a Malaysian vessel in Singapore's territory last Wednesday. The act went against the spirit of an agreement concluded by the foreign ministers of both countries just a day earlier. He was replying to Mr Vikram Nair (Sembawang GRC) who, while commending the Government's calm and sensible approach to the tensions, was concerned that Malaysia's actions were not consistent. ''If one side is being sincere (but) the other side is not or is not able to follow through with actions, what can we do?'' he asked. Echoing a similar sentiment, Mr Alex Yam (Marsiling-Yew Tee GRC) noted that each time Malaysia commits a provocative act, Singapore is firm, saying ''don't do it again''. But will the time come when Singapore will make it clear that further provocation will be met with an equal reaction, he asked. In the end, it is Singapore's reputation for consistency and constancy that adds to the Republic's reputation of reliability and integrity. ''So, that is the way we deal,'' Dr Balakrishnan said. It does not mean Singapore is passive or is giving in, he added. Different factors are at play when such negotiations are conducted. For example, ''knowing we have a credible and strong SAF (Singapore Armed Forces) again makes diplomacy much easier''. Ultimately, the objective is for the spirit of candidness, sincerity and openness to prevail for the issues to be resolved. On a positive note and in response to a question by Workers' Party chief Pritam Singh (Aljunied GRC) on whether the Malaysian government is sincere in wanting to resolve the tensions, Dr Balakrishnan said he has found Foreign Minister Saifuddin Abdullah and Minister Azmin to be sincere, constructive and helpful. In some instances, goodwill prevails, he said to Mr Liang Eng Hwa (Holland-Bukit Timah GRC), who asked if the Johor authorities appreciate Singapore's efforts to supply additional treated water to the Malaysian state. Singapore had supplied additional treated water between Jan 2 and 4 at Johor's request after pollution disrupted its production. Dr Balakrishnan said that under the 1962 Singapore-Malaysia water agreement, Singapore is obliged to sell to Malaysia only 5 million gallons a day. In practice, it supplies Johor 16 million gallons of treated water daily. But the Republic's security agencies have been ordered to exercise restraint and avoid escalating tensions for now, "so as not to jeopardise the conditions necessary for constructive discussions and peaceful resolution of the dispute". Dr Ng made the point when replying to Non-Constituency MP Dennis Tan, who had asked what has been and will be done to prevent more Malaysian vessels from entering Singapore's territorial waters. Last week, Johor Menteri Besar Osman Sapian posted on Facebook photos of him visiting a Malaysian government vessel anchored in Singapore's territorial waters off Tuas. Incidents like this are "provocative and escalatory", and contradict the officially stated policy of the Malaysian government, Dr Ng said. "Tensions and real risks increased during this incident," he said, adding that Singapore's security agencies had detected the movement of Datuk Osman's entourage early, during which the number of Malaysian government vessels in Singapore's waters increased from two to five. "Our Police Coast Guard and Republic of Singapore Navy vessels responded promptly to this provocation, as they had to," he said. "As a result, the total number of vessels in the area more than doubled. These provocations do nothing to help resolve disputes and indeed can precipitate incidents on the ground, which will do lasting harm to bilateral ties." In October last year, Malaysia unilaterally extended the Johor Baru port limits into Singapore's territorial waters off Tuas. Daily intrusions into these waters by Malaysian government vessels since November have continued despite the Malaysian Foreign Affairs Ministry declaring that it would take "all effective measures" to de-escalate the situation on the ground. On Monday, Foreign Minister Vivian Balakrishnan delivered a ministerial statement in Parliament setting out Singapore's position on the various disputes with Malaysia, including the issue of maritime boundaries. Dr Balakrishnan said Malaysia's extension of port limits goes beyond even the territorial sea claims in its 1979 map, which Singapore has rejected consistently. He also highlighted how Singapore has long exercised sovereignty and patrolled the disputed waters without any protest from Malaysia. Dr Ng said Singapore's Police Coast Guard, Republic of Singapore Navy, and Maritime and Port Authority will continue to protect and assert the Republic's sovereignty in its territorial waters off Tuas and the waters in Singapore port limits. "Our security agencies carry out their operational duties with the utmost professionalism," he said, adding that Singapore's security personnel have repeatedly pressed the Malaysian vessels to leave the area. "We will continue to do so as their presence does not strengthen Malaysia's legal claims in any way, and indeed can result in mishaps or regrettable incidents," he said. Separately, Malaysia's Economic Affairs Minister Azmin Ali told reporters after the swearing-in of the new Sultan of Pahang yesterday that there were bilateral issues, but added: "With the wisdom and the leadership of both countries, I believe engagement will provide a better result." PUTRAJAYA • Ties between Malaysia and Singapore are still "good", Malaysian Foreign Minister Saifuddin Abdullah said yesterday, despite ongoing air and maritime disputes between the two countries. "Our relations with Singapore remain good. There are some issues but we are talking to each other, and that is very important," said Datuk Saifuddin, according to a report by national news agency Bernama. "Most importantly, the discussions are going on. I am confident the discussions are moving in the right direction," he added. He said five senior government officials will meet their Singaporean counterparts to discuss these issues. Besides Mr Saifuddin, the others are Transport Minister Anthony Loke, Economic Affairs Minister Azmin Ali, Attorney-General Tommy Thomas, and Foreign Ministry secretary-general Muhammad Shahrul Ikram Yaakob. Singapore and Malaysia are locked in two separate disputes over territorial waters off Tuas, and airspace management over southern Johor. The disagreements are the latest in a string of bilateral hiccups since Tun Dr Mahathir Mohamad returned to power as Malaysia's Prime Minister after an unprecedented change of government in May last year. The dispute over maritime boundaries started after Kuala Lumpur, on Oct 25 last year, unilaterally extended the Johor Baru port limits into Singapore's territorial waters off Tuas. Daily intrusions into these waters by Malaysian government vessels since November last year have continued despite the Malaysian Foreign Affairs Ministry declaring that it would take "all effective measures" to de-escalate the situation on the ground. Malaysia has also objected to the implementation of new landing procedures for Singapore's Seletar Airport. Last week, Singapore and Malaysia took steps to defuse their air and maritime tensions, with Mr Saifuddin and his Singaporean counterpart Vivian Balakrishnan reiterating their commitment "to preserving the vital relationship between both countries and improving bilateral ties on the basis of equality and mutual respect". A day later, however, Johor Menteri Besar Osman Sapian boarded a vessel in the disputed waters off Tuas, an act that resulted in the postponement of the Joint Ministerial Committee for Iskandar Malaysia (JMCIM) meeting, which was originally scheduled to take place earlier this week on Monday. Singapore, which has formally protested against the intrusion, said his presence on a Malaysian vessel in Singapore's territory had rendered holding the JMCIM "untenable". Malaysia has maintained that he was in Malaysian waters. Mr Saifuddin yesterday said the channels of communication between the two countries remain open. This was evident when Datuk Seri Azmin met Dr Balakrishnan earlier this week despite the postponement of the JMCIM. "We have always safeguarded our sovereignty and our independence. We just have to continue talking to our Singapore counterparts," Mr Saifuddin said. 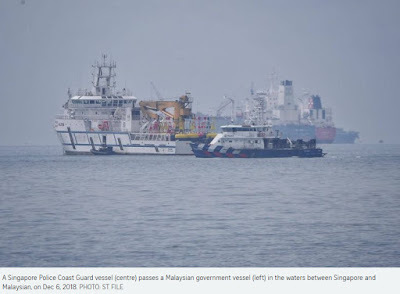 The intrusion by Johor's Menteri Besar into Singapore waters off Tuas last Wednesday went against the spirit of the agreement concluded by the foreign ministers of both countries just a day earlier. Stressing the point in Parliament yesterday, Foreign Affairs Minister Vivian Balakrishnan said: "It undermined the goodwill and trust necessary for further cooperation between the two countries, especially cooperation involving Johor. It made it untenable to proceed with the JMC (Joint Ministerial Committee) meeting." The 14th JMC for Iskandar Malaysia was to have been held yesterday as part of ways both sides can cooperate to develop the Iskandar Development Region in Johor. But on the eve of the meeting, Singapore's Foreign Affairs Ministry said Datuk Osman Sapian's presence on a Malaysian vessel in Singapore's territory last Wednesday had made the meeting untenable. Yesterday, Dr Balakrishnan said the meeting was to have been chaired by National Development Minister Lawrence Wong and Malaysian Minister for Economic Affairs Azmin Ali, involving Singapore and Malaysia's ministers and officials, and Johor officials, including Mr Osman. "But most regrettably, the Menteri Besar staged a publicised visit to the Malaysian Marine Department vessel anchored in Singapore territorial waters off Tuas on Jan 9, 2019," he added. Mr Osman had posted on Facebook later the same day about his visit to the vessel. Singapore formally protested against the intrusion via a Third Person Note to Malaysia, and proposed postponing the meeting. Malaysia agreed. Dr Balakrishnan said he informed Malaysian Foreign Minister Saifuddin Abdullah and Datuk Azmin of the postponement. "I should add that my discussions with both ministers, before and after the Johor Menteri Besar's actions, have been amicable and constructive, focused on trying to resolve the issues. "Datuk Azmin met me yesterday. He also met ministers Khaw Boon Wan (Coordinating Minister for Infrastructure and Minister for Transport) and Lawrence Wong today to discuss several bilateral projects which he is in charge of." Despite the difficulties, Dr Balakrishnan said Singapore still hopes to work with Malaysia for better ties and closer cooperation. "However, both sides must act in good faith, in compliance with international law and norms, and honour existing agreements," he said. Malaysia's allegations that introducing an aircraft landing system at Seletar Airport would affect the development of nearby Pasir Gudang town are untrue, Foreign Minister Vivian Balakrishnan said. In debunking the claims in Parliament yesterday, he said the new Instrument Landing System (ILS) uses the exact same flight path that aircraft landing at Seletar have used all along for visual flights. The only difference is with ILS, pilots can land even in bad weather. The disagreement over flight procedures for Seletar Airport is part of an air dispute that includes Malaysia wanting to take back management of airspace over south Johor, a task delegated to Singapore. Both countries' transport ministers have agreed to meet later this month for further discussions, Dr Balakrishnan said. On Malaysia's protest on the ILS, he said: "There were allegations that Pasir Gudang will not be able to have buildings taller than five storeys because of ILS, but if members cross the Causeway and drive around Pasir Gudang, you will see there are already structures as tall as 105m there (taller than many HDB blocks)," he added. Showing the House a satellite photograph, he pointed to several existing high-rise developments in the Pasir Gudang area. Ultimately, he said, the aim of the ILS procedures is to improve safety and facilitate flights, in this case especially for Malaysia's Firefly. The airline, which had earlier agreed to move its operations to Seletar Airport on Dec 1 last year, had informed the Civil Aviation Authority of Singapore (CAAS) that Malaysia's civil aviation authority required Malaysian carriers to operate only to airports with an instrument approach. "Ironically, CAAS was trying to facilitate Firefly's operations at Seletar by installing the ILS, which Malaysia has now objected to," Dr Balakrishnan said. Amid the tensions, the Malaysian civil aviation authority declared on Dec 25 a permanent restricted area in the airspace over Pasir Gudang for the purpose of military activities, with effect from Jan 2. What it meant was that flights from any country, including Malaysia, would need the prior approval of the Royal Malaysian Air Force to operate in that zone between 2,000 ft (610m) and 5,000 ft.
Malaysia's action contravened established International Civil Aviation Organisation (ICAO) procedures, Dr Balakrishnan said. "CAAS, as the air traffic services provider for the area, was neither informed nor consulted even though these actions affected civil aviation operations out of Seletar Airport, cut through an established international aviation route, and affected flight efficiency and safety," Dr Balakrishnan stressed. At last week's meeting between the two countries' foreign ministers, both sides agreed that while Singapore would suspend the implementation of the ILS procedures for Seletar Airport, Malaysia would also suspend the permanent restricted area. They will do it for one month in the first instance. The mutual suspension, which went into effect at midnight on Jan 9, allows for normal operations to resume at Seletar Airport, Dr Balakrishnan said. "Unfortunately, Malaysia's Firefly will still be unable to start operating at Seletar due to its Malaysian regulator's requirement," he added. Apart from the ILS issue, Malaysia has said that it intends to review the 1974 Operational Letter of Agreement on airspace arrangements in southern Johor. The agreement says that Singapore will manage the airspace which covers the Pasir Gudang area. Singapore had said that it would review the proposal after receiving it. Dr Balakrishnan said: "Such discussions on air navigation arrangements involve consultations with international stakeholders, and cannot be done overnight. "In the meantime, in the interest of civil aviation safety, air traffic operations must continue according to current arrangements, and in accordance with ICAO requirements." Malaysia's Economic Affairs Minister Azmin Ali was scheduled to jointly chair a meeting on bilateral cooperation for Iskandar Malaysia with Singapore's National Development Minister Lawrence Wong here yesterday. But the meeting of the Joint Ministerial Committee (JMC) for Iskandar Malaysia was postponed last week following Johor Menteri Besar Osman Sapian's intrusion into Singapore territorial waters. Nevertheless, Datuk Seri Azmin made a two-day visit that saw both governments affirming a desire to maintain good ties to benefit their interdependent economies. Mr Azmin met Mr Wong over breakfast yesterday morning before meeting Coordinating Minister for Infrastructure and Minister for Transport Khaw Boon Wan. He also met Foreign Minister Vivian Balakrishnan on Sunday. All four leaders have since posted on their respective social media channels about putting "bilateral relations back on track" and working towards the mutual benefit of the two neighbours. Mr Azmin said in a Facebook post after his meeting with Mr Wong that they had "a frank and positive discussion on bilateral issues concerning Singapore and Malaysia". Mr Wong said on Facebook that they had a good breakfast meeting. "I am glad that minister Azmin continued with his visit to Singapore to meet with us, and to discuss ways to put our bilateral relations on track," he said. "The JMC has met for more than 10 years and has overseen many projects, including joint investment and tourism promotion," added Mr Wong. "These projects have been mutually beneficial because our economies are closely intertwined and highly interdependent. That is why we both want good and stable bilateral relations, so that both sides can do more together to spur each other's development and success." Dr Balakrishnan, who had dinner with Mr Azmin on Sunday and thereafter a stroll together along the Singapore River, said in a Facebook post: "We had an open and candid discussion of the issues currently confronting us. We reaffirmed that there are far more opportunities for Malaysia and Singapore to work together, especially at this time of global economic transformation." In a Facebook post, Mr Azmin, a senior minister in Prime Minister Mahathir Mohamad's Cabinet, described their meeting as "productive... as we work towards resolving some bilateral issues". The postponement of the JMC meeting was the latest in a string of bilateral hiccups since Tun Dr Mahathir Mohamad returned to power following an unprecedented change of government last May. The maritime dispute was sparked when, on Oct 25, Malaysia unilaterally extended the Johor Baru port limits to encroach on Singapore territorial waters. The foreign ministers of both countries met in Singapore last Tuesday and agreed to resolve their bilateral airspace and maritime disputes in a calm and constructive manner. But after Datuk Osman boarded a Malaysian government vessel to visit another vessel anchored illegally in Singapore's territorial waters off Tuas, Singapore protested against the intrusion in a diplomatic note and proposed to postpone the JMC meeting. Malaysia agreed. Dr Balakrishnan explained to Parliament yesterday that the intrusion went against the spirit of the foreign ministers' agreement. He said: "It undermined the goodwill and trust necessary for further cooperation between the two countries, especially cooperation involving Johor. It made it untenable to proceed with the JMC meeting." Mr Osman would also have been involved in the JMC meeting. "But, most regrettably, the Menteri Besar staged a publicised visit to the Malaysian Marine Department vessel anchored in Singapore territorial waters off Tuas on Jan 9, 2019," Dr Balakrishnan said. The postponed meeting would have been the 14th for the JMC, which was set up in 2007 for both sides to work together in the South Johor economic zone of Iskandar, on areas from transport to tourism. This includes the Kuala Lumpur-Singapore High-Speed Rail (HSR) and the Rapid Transit System (RTS) linking Woodlands and Johor Baru. Mr Azmin and Mr Khaw had led talks to defer the HSR last year, and Mr Azmin said the fruitful outcome of those negotiations had laid the "foundation for a positive working relationship to resolve issues". Mr Khaw said of their meeting in a Facebook post: "He is aware of the unnecessary disputes at Tuas and Seletar. We share a common desire to bring bilateral relations back on track, so that good projects, like the RTS Link between Woodlands and JB, can materialise, to benefit both our peoples." The planned Rapid Transit System (RTS) Link between Johor Baru and Singapore is "behind schedule and not progressing well", Transport Minister Khaw Boon Wan said yesterday. This means the start of cross-border MRT services - which were intended to ease congestion at land checkpoints - will likely be delayed beyond the original target date of Dec 31, 2024, he said. He was responding in a written parliamentary reply to Mr Ang Wei Neng (Jurong GRC), who had asked for a progress update on the RTS. Mr Khaw, who is also Coordinating Minister for Infrastructure, said several milestones set out in the legally binding RTS Link bilateral agreement inked in January last year have been missed. A joint venture comprising Singapore's SMRT and Malaysia's Prasarana Malaysia Berhad should have been formed by June 30 last year. It should then have been appointed as the RTS Link operator through a concession agreement with Singapore's Land Transport Authority (LTA) and the Malaysian government by last September. But over the past few months, Malaysia has indicated that it is considering replacing its joint venture partner, Mr Khaw said. It has, however, delayed confirming this partner - first until September last year, then December. On Dec 28, it requested to be given until Feb 28 this year to do so. "As a result of these delays, the joint venture company has not even been incorporated to date, let alone signed the concession agreement," Mr Khaw said. "Meanwhile, Malaysia has also unilaterally suspended bilateral discussions to appoint the RTS Link operator since August 2018, pending its confirmation of the Malaysian joint venture partner." Under the bilateral agreement, both countries are obliged to jointly call a fair, international and transparent open tender to appoint an operating company if this has not been done by the original deadlines, or if the joint venture company has not been incorporated - unless both governments mutually agree to postpone these deadlines. In November, Singapore sent draft tender documents to Malaysia, but has not received a response. This means there is a "real risk" that both countries will not be ready to call a joint open tender by March 31, Mr Khaw said. Missing this deadline may in turn lead to the appointed operating company being unable to procure the Thomson-East Coast Line core systems for the RTS before these procurement options expire, he added. Mr Khaw noted that the LTA has assembled nearly 70 staff to implement the RTS. Civil tenders have also been called, including to build Singapore's RTS Link Woodlands North station and its portion of the RTS Link crossing bridge. He added that Singapore has been reasonable and flexible "because we understand Malaysia's circumstances following the May 2018 Malaysian general elections". But there are "serious implications" to missing the agreed deadlines and thereafter failing to engage with Singapore to work on jointly calling an open tender to appoint the operating company. The RTS bilateral agreement, he said, is a binding international treaty regardless of changes to governments, and makes clear each country's responsibilities and the consequences of not meeting them. Mr Khaw also said that Singapore will continue to take a "constructive approach" to move the project forward, and remains fully committed to implementing it. Singapore's Ministry of Foreign Affairs (MFA) said yesterday that it welcomed Malaysian Economic Affairs Minister Mohamed Azmin Ali's initiative to visit Singapore, despite the postponement of an annual bilateral meeting due to a "provocative act" by the chief minister of Johor. Datuk Seri Azmin began a two-day visit yesterday that includes meetings with Singapore's National Development Minister Lawrence Wong and Foreign Minister Vivian Balakrishnan. Dr Balakrishnan said on Facebook that he had a "good meeting of minds" over dinner with Mr Azmin. He also posted a photo of himself and the Malaysian minister chatting while on a stroll along the Singapore River. He added that he had an open and candid discussion with Mr Azmin and both reaffirmed that there are "far more opportunities for Malaysia and Singapore to work together, especially at this time of global economic transformation". The meeting comes in the wake of a decision by Singapore to push back the Joint Ministerial Committee for Iskandar Malaysia (JMCIM), originally scheduled for today. Responding to media queries yesterday, the ministry revealed that it had sent a protest note to the Malaysian government on Friday over an intrusion by the Johor chief minister. "Singapore sent a diplomatic note to Malaysia on Jan 11, 2019 to protest the unauthorised visit by Johor Menteri Besar Dato' Osman Sapian on Jan 9, 2019 to Marine Department Malaysia vessel Pedoman, which was anchored illegally in Singapore territorial waters off Tuas," it said. "Such a provocative act went against the spirit of the agreement reached a day earlier by Singapore's Minister for Foreign Affairs, Dr Vivian Balakrishnan, and his Malaysian counterpart, Dato' Saifuddin Abdullah, to resolve bilateral issues in a calm and constructive manner." "Nevertheless, Singapore welcomes Malaysia's Minister of Economic Affairs Dato' Seri Mohamed Azmin Ali's initiative to make a bilateral visit and his upcoming meetings with our ministers on Jan 13 to 14," the ministry said. Earlier yesterday, the Malaysian Foreign Affairs Ministry had released its own statement, expressing its confidence in the current momentum of engagement between Malaysia and Singapore and stressing that it is committed to strengthening bilateral ties with the Republic. Malaysia said the planned alternative meeting between ministers "demonstrates that ties between the two countries remain strong". The meeting will form "the next positive step forward after the fruitful bilateral meeting" held between the foreign ministers of Malaysia and Singapore on Jan 8, the statement added. "The ministry is confident that the current momentum of engagement between Malaysia and Singapore will continue and reiterates its commitment to strengthen bilateral relations with Singapore based on equality and mutual respect." It also said the foreign ministers of both countries "are in communication and agreed that both sides should remain calm and not sensationalise the matter". But amid the niceties in the statement was also a rephrasing of the content of Singapore's diplomatic note to imply that the Johor chief minister had not intruded. It said: "The reason for the postponement, as conveyed by Singapore vide a diplomatic note dated Jan 11, 2019, was due to the visit by YAB Dato' Osman Sapian, the Chief Minister of Johor, to Johor Baru port in Malaysian territorial waters on Jan 9." JOHOR BARU • A video clip showing Johor Menteri Besar Osman Sapian being stopped from getting into a Proton Saga car has gone viral on social media. The car was being driven by Johor ruler Sultan Ibrahim Sultan Iskandar to take Prime Minister Mahathir Mohamad to the airport last week. In the 31-second clip, Sultan Ibrahim and Tun Dr Mahathir are seen in the driver and front passenger seat respectively, while Datuk Osman is seen trying to open the left passenger door at the back. However, he is stopped by a man wearing a military uniform, believed to be Sultan Ibrahim's military aide de camp. Mr Osman is then seen uttering a few words to the two leaders. The incident happened after Dr Mahathir had an audience with Sultan Ibrahim at Istana Bukit Serene last Thursday. The meeting lasted 1½ hours. Sultan Ibrahim then drove Dr Mahathir back to Senai International Airport in a first-generation Proton Saga, which the Prime Minister had gifted to the ruler's father, way back in 1985. The video, which was uploaded by Ops Johor on its Facebook page, garnered 599 comments, 935 shares and 185,000 views on social media as of noon last Saturday. An annual bilateral meeting between Singapore and Malaysia set for tomorrow has been postponed following the intrusion by Johor's Menteri Besar into Singapore waters off Tuas. Singapore's Ministry of Foreign Affairs (MFA) said yesterday that Datuk Osman Sapian's presence on a Malaysian vessel in Singapore's territory on Wednesday had rendered the 14th Joint Ministerial Committee for Iskandar Malaysia (JMCIM) "untenable". "Singapore therefore proposed to postpone the JMCIM meeting, and Malaysia agreed," the MFA spokesman said. The committee was set up in 2007 to study how the two neighbours can work together in the South Johor economic zone of Iskandar. The Malaysian delegation at this year's meeting was supposed to have been led by Economic Affairs Minister Azmin Ali, Mr Osman and other Johor state leaders. According to an official source who could not be named due to the sensitivity of the matter, Mr Osman's presence on the vessel was not sanctioned by Malaysia's federal government. "He was told not to do it, yet he went ahead anyway," the source said. Datuk Seri Azmin told reporters yesterday that the countries mutually agreed to postpone the JMCIM meeting as certain issues on the table were closely related to matters raised in a meeting between their foreign ministers last Tuesday. "I do not want to interfere with the process by having the JMCIM meeting now. It's a good idea to defer it," he said. Datuk Seri Azmin will instead have separately scheduled meetings with Singapore's Foreign Minister Vivian Balakrishnan and National Development Minister Lawrence Wong today and tomorrow. Both countries had agreed last week to establish a working group to study the legal and operational issues relating to the maritime dispute, to provide a basis for further discussions and negotiations. The dispute over maritime boundaries started after Kuala Lumpur, on Oct 25 last year, unilaterally extended the Johor Baru port limits such that they encroach on Singapore's territorial waters off Tuas. The new boundary line extends beyond what Malaysia had previously claimed as its own waters in a 1979 map, which Singapore has never accepted. Singapore on Dec 6 extended its own port limits in response, to cover the full extent of the Republic's territorial waters. Mr Osman on Wednesday night took to social media to share photos of him visiting the MV Pedoman which was anchored off Tuas, saying he received a briefing from Malaysian Marine Department officers regarding the border that is being disputed. His Facebook post came a day after foreign ministers from both sides met in Singapore and agreed to form a working group to study and discuss the dispute over maritime boundaries. Mr Osman has since denied that he was in Singapore waters, saying in a Facebook post on Friday that he was visiting personnel on duty to safeguard the boundary, and that the allegations were an attempt at obfuscation. Relations between Singapore and Malaysia will be a key focus of discussion at the first Parliament sitting of the year tomorrow when Dr Balakrishnan delivers a ministerial statement. Seven MPs and two Nominated MPs have also filed questions on the ongoing disputes over airspace and maritime boundaries, according to the agenda on the sitting issued by the Clerk of Parliament on Friday. His Facebook post came a day after foreign ministers from both countries met in Singapore and agreed to form a working group to study and discuss the dispute over maritime boundaries. Mr Osman said he visited officers on duty aboard Malaysian Marine Department (MMD) vessel MV Pedoman. Johor state exco member Tan Hong Pin was also seen in a photo. "Captain Mohamad Azlan Aziz explained the maritime boundary limits in dispute between two countries," Mr Osman wrote. "I thank, for their service and sacrifice, members of safety agencies and public officers who are committed to monitor and defend our waters." Also seen in Singapore waters were Malaysian Maritime Enforcement Agency vessel KM Marudu and MMD vessel Tanjung Puteri, which Mr Osman used to visit MV Pedoman in Singapore waters. Responding to media queries yesterday, the Maritime and Port Authority of Singapore (MPA) said there were five Malaysian government vessels in Singapore's waters as of 6pm on Wednesday. 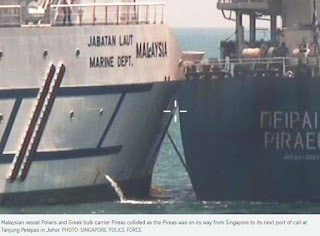 The MPA also confirmed that two vessels remained in Singapore waters as of 6pm yesterday. On Tuesday, Foreign Minister Vivian Balakrishnan and his Malaysian counterpart Saifuddin Abdullah had announced that the working group will be headed by permanent secretary for foreign affairs Chee Wee Kiong and his Malaysian counterpart Muhammad Shahrul Ikram Yaakob. It will study and discuss the legal and operational matters, to de-escalate the situation on the ground and provide a basis for further discussions and negotiations. The working group being formed to discuss issues surrounding the two port limits is to report to the foreign ministers in two months. Both ministers had also stressed the need to keep the situation on the ground calm to allow talks to take place. Kuala Lumpur had on Oct 25 last year unilaterally extended the port limits for Johor Baru port, such that they encroach on Singapore's territorial waters off Tuas. As a result, Malaysian government vessels had intruded into Singapore waters. After the Tuesday meeting, the foreign ministers also announced that Malaysia will immediately suspend its permanent restricted area over Pasir Gudang for flights, while Singapore will do the same for new aircraft landing procedures for Seletar Airport. The arrangement will be for a month, in the first instance. KUALA LUMPUR • Malaysian carrier Firefly is projected to incur monthly losses of up to RM20 million (S$6.6 million) due to the suspension of its direct flights to Singapore from Kuala Lumpur, a top official said, following the airspace dispute between Malaysia and the Republic. "The exposure, the revenue lost (from the suspension) is RM15 million, so we are looking at RM15 million to RM20 million revenue lost on a monthly basis," Malaysia Aviation Group (MAG) chief executive Izham Ismail told The Malaysian Insight news site. "Firefly has been doing well over the past three years, so this is a huge dent to the group," he added. MAG, a 100 per cent owned unit of Malaysia's sovereign fund Khazanah Nasional, owns both national carrier Malaysia Airlines (MAS) and Firefly. Firefly in Malaysia offers its turboprop flights from Subang Airport, at the edge of Kuala Lumpur. At Changi Airport, Firefly offers 20 daily flights to and from Subang, Ipoh and Kuantan. Flight analytics group FlightGlobal said in a December report that services between Singapore and Subang accounted for 33.2 per cent of Firefly's seat capacity. This compared with 24.6 per cent of its seat capacity for flights between Subang and Penang, and 18.8 per cent between Subang and Johor Baru. The RM20 million monthly loss could weaken the company's revenue. The Companies Commission of Malaysia said Firefly narrowed its net loss to RM36.65 million for the financial year ended Dec 31, 2017, from RM249.56 million in the 2015 financial year. Revenue fell 9.1 per cent to RM301.9 million in 2017, against RM332.16 million in 2015, The Edge newspaper reported in September last year. Firefly, a subsidiary of MAS, did not file its 2016 financial statement, the report said. Firefly suspended operations to Singapore from Dec 1, saying that it did not have approval from the Civil Aviation Authority of Malaysia (CAAM) to make the move from Changi Airport to Seletar Airport. The carrier first agreed in 2014 that it would transfer all operations to a new passenger terminal to be built at Seletar Airport to handle turboprop flights. According to CAAM, there are regulatory issues that need to be resolved between the civil aviation authorities of both countries over the proposed move to Seletar Airport, as well as outstanding airspace issues. These have to do with Malaysia wanting to take back air traffic services for airspace over southern Johor that were delegated to Singapore in 1974. Singapore has said that the only change on its introduction of the Instrument Landing System is that pilots will be guided using ground instruments so that they no longer have to rely on just their vision. Besides the air dispute, Singapore and Malaysia are also locking horns over territorial waters off Tuas. On Tuesday, the two countries agreed to defuse tensions after their foreign ministers met. On the air front, the ministers said Malaysia will immediately suspend its permanent restricted area over Pasir Gudang for flights, which it had imposed on Dec 25, while Singapore will do the same for new aircraft landing procedures for Seletar Airport. The arrangement will be for a month, in the first instance. Firefly's chief executive Philip See told The Malaysian Insight that he sent a letter to Changi Airport Group on Wednesday to request landing slots at Changi. Singapore's Transport Minister Khaw Boon Wan had said previously that Firefly's slots at Changi Airport had been redistributed to other airlines. Singapore and Malaysia are taking steps to defuse their air and maritime tensions, as foreign ministers on both sides reiterated their commitment "to preserving the vital relationship between both countries and to improving bilateral ties, on the basis of equality and mutual respect". Both countries are locked in two separate disputes - over territorial waters off Tuas and airspace management over southern Johor. On the air front, the ministers said yesterday that Malaysia will immediately suspend its permanent restricted area over Pasir Gudang for flights, while Singapore will do the same for new aircraft landing procedures for Seletar Airport. 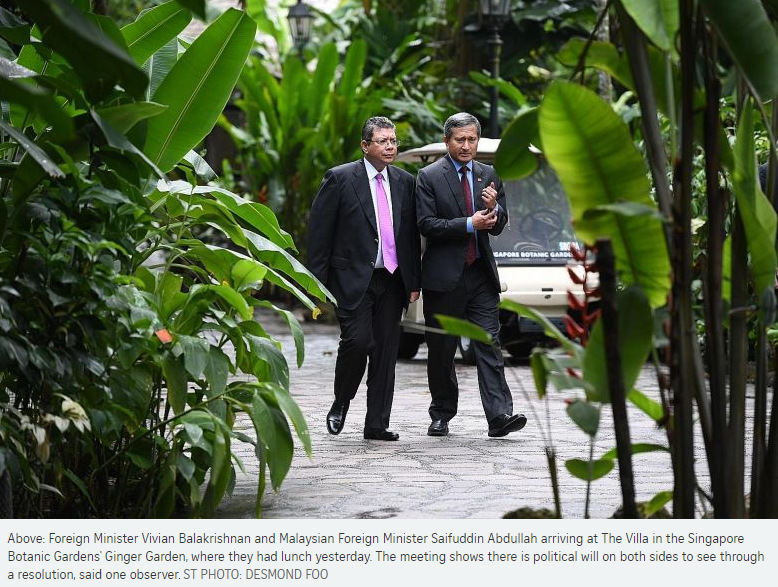 In a joint declaration after a meeting in Singapore yesterday, Foreign Minister Vivian Balakrishnan and his Malaysian counterpart Saifuddin Abdullah stressed the need to keep the situation on the ground calm to allow discussions to take place. They said the transport ministers of both countries should meet soon for discussions "to ensure the safety and efficiency of civil aviation". On maritime issues, the ministers said a working group will be set up, headed by permanent secretary for foreign affairs Chee Wee Kiong and his Malaysian counterpart Muhammad Shahrul Ikram Yaakob. It will study and discuss the legal and operational matters in order to de-escalate the situation on the ground, and provide a basis for further discussions and negotiations. Addressing a joint press conference, both ministers stressed that Singapore and Malaysia have strong, close ties. Dr Balakrishnan said: "Malaysia and Singapore will always be close and permanent neighbours. That is a geographical fact. And it is essential that we always have a constructive and cooperative bilateral relationship. Both of us, my brother Saifuddin from Malaysia and I - we had a very positive, very constructive and very necessary meeting today." The air disagreement first surfaced on Nov 23, when Malaysian carrier Firefly said it would suspend all flights to Singapore from Dec 1, the day it was supposed to move its operations from Changi to Seletar Airport. Malaysia objects to new landing procedures for Seletar, claiming they would impose height restrictions and affect developments in Pasir Gudang. Singapore has, however, denied this, saying that the only change on introducing an Instrument Landing System (ILS) is that pilots will be guided using ground instruments so that they no longer have to rely on just their vision. On Dec 25, Malaysia established a permanent restricted area for the purpose of military activities over Pasir Gudang. This means that flights from any country, including from Malaysia, would need prior approval from the Royal Malaysian Air Force to operate in that zone between 2,000 and 5,000 feet. Singapore is concerned that the restricted area being in a "controlled and congested airspace" would impact the existing and normal operations of aircraft transiting through, the Transport Ministry said last week. The provision of air traffic services for the airspace over southern Johor had been delegated by Malaysia to Singapore in 1974. Malaysia now wants to take back the management of the airspace. At sea, Kuala Lumpur had on Oct 25 unilaterally extended the port limits for Johor Baru port, such that they encroach on Singapore's territorial waters off Tuas. As a result, Malaysian government vessels had entered Singapore's waters. The working group being formed to discuss issues surrounding the two port limits is to report to the foreign ministers within two months. Said Mr Saifuddin: "We have a long history of good relations and there is only one way to go forward - that is to become stronger in our ties and improve in our relations." Finance Minister Heng Swee Keat, who with Deputy Prime Minister Teo Chee Hean met Malaysian Prime Minister Mahathir Mohamad in Putrajaya on Dec 31 to discuss the disputes, said in a Facebook post: "As neighbours, Singapore and Malaysia have deep historical, economic, cultural, and people-to-people ties. It is important that we have a constructive and peaceful relationship and find win-win solutions that benefit the peoples of both countries." On Dec 25, the Civil Aviation Authority of Malaysia (CAAM) declared a permanent restricted area in the airspace over Pasir Gudang for the purpose of military activities. The information was disseminated through a Notice to Airmen (Notam) - a notice that is filed to alert the global aviation community of potential hazards along a flight route or at a location that could affect the safety of flight. In its notice, the CAAM said the restriction would take effect from Jan 2. What it meant was that flights from any country, including Malaysia, would need prior approval from the Royal Malaysian Air Force to operate in that zone between 2,000 and 5,000 feet. 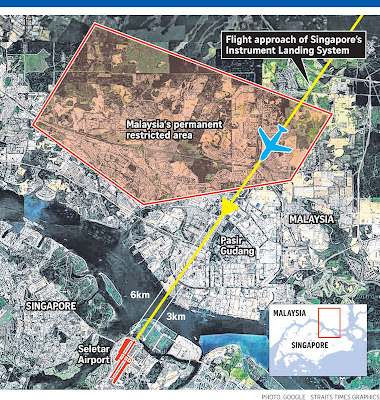 The restricted zone was in the flight path for landing and take-off at Singapore's Seletar Airport, from the north. 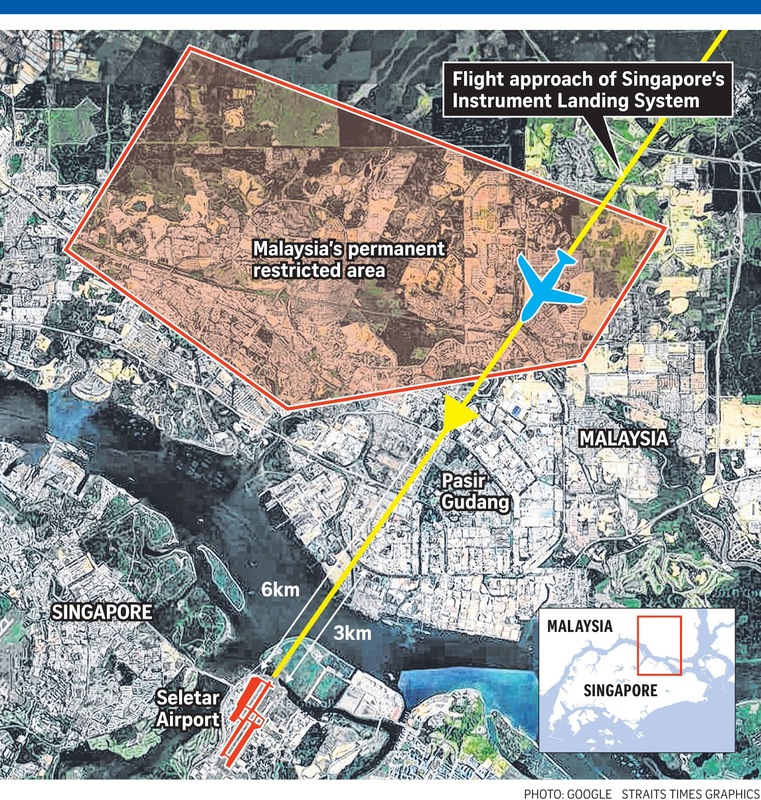 It meant planes heading to and from Seletar would have to ensure that they avoid the stipulated area. This can be done by going into an upward spiral soon after take-off to go over the 5,000 feet threshold and spiralling down when landing in Singapore, experts said. While there are no commercial airlines that operate scheduled services to Seletar Airport, the restriction had affected private and chartered flights. While it is not uncommon for countries to declare restricted air zones when they conduct military activities, this is usually done in areas where there are limited commercial flying activities, the experts pointed out. There are also procedures and guidelines set by the International Civil Aviation Organisation (ICAO) on this. For example, countries should first consult and give advance notice to key stakeholders. When Singapore decided to build a new and bigger passenger terminal at Seletar Airport - which opened in November - the plan was to introduce an Instrument Landing System (ILS). Such a system, installed at many other airports, uses ground instruments to help air traffic controllers guide pilots coming in for landing. Without an ILS, pilots have to rely on just their vision, which means they cannot land in bad weather, for example. Pilots typically prefer an ILS because it offers a more precise landing path, experts said. Malaysia, however, protested and its carrier Firefly suspended all flights to Singapore from Dec 1, the day it was supposed to move its operations from Changi to Seletar Airport. Malaysia claimed the new landing procedure would restrict developments at Pasir Gudang town which is near Seletar Airport. Singapore has denied this, saying that the use of ILS at Seletar Airport does not change existing height limits. The flight path and height limits are in accordance with safety and operational standards prescribed by the International Civil Aviation Organisation (ICAO), the Republic has said. In objecting to the proposed ILS at Seletar Airport, Malaysia has also claimed that Pasir Gudang port will be subjected to higher risks. Experts, though, have dismissed this, saying that for more than three decades, Singapore has safely managed the nexus between aircraft operations and ships transiting the Johor Strait to Pasir Gudang port. Systems such as the Civil Aviation Authority of Singapore Vessel Height Measuring System are in place to safeguard both aviation and maritime activities. Flights get held back while tall vessels cross the Strait of Johor. Singapore and Malaysia will proceed with scheduled meetings to "discuss the way forward" on both airspace and maritime issues, Malaysia's Foreign Affairs Ministry said in a statement yesterday. Malaysia said their foreign ministers met at an Asean retreat in Chiang Mai on Thursday and Friday, as part of its "continuing efforts... to pursue diplomatic solutions to bilateral issues with its closest neighbour Singapore, in a peaceful and constructive manner, on the basis of equality and mutual respect". Although the Malaysian Foreign Ministry did not give an exact date, its statement said both countries' transport ministers will meet "in the coming weeks" to discuss airspace-related issues, including the Instrument Landing System and approach procedures for Seletar Airport. On Jan 28, top Foreign Ministry officials will also discuss and find solutions to Malaysia-Singapore maritime issues "as well as the legal and operational matters in order to de-escalate the situation on the ground, and provide a basis for further discussions and negotiations". "Despite recent incidents that seemed to undermine ongoing diplomatic efforts, Dato Saifuddin Abdullah received a letter with positive undertones from Dr Vivian Balakrishnan," the Malaysian Foreign Ministry said in a statement. It was referring to Johor Menteri Besar Osman Sapian's provocative visit on Jan 9 to waters off Tuas, which resulted in the postponement of an annual bilateral ministerial meeting. This statement from Kuala Lumpur follows up on the two foreign ministers' agreement on Jan 8 - the day before Datuk Osman's action - to establish a working group on both disputes. On Thursday, Datuk Osman claimed he had the "unofficial blessing" of Foreign Minister Saifuddin to board a Malaysian Marine Department vessel anchored off Tuas, in what Malaysia maintains is its territory under Johor Baru port. Singapore has consistently treated the area as part of its territorial waters. But the Foreign Ministry on Friday denied approving his trip, saying that "upon learning of the planned visit from a Malaysian enforcement agency on the morning of 9 January itself", it "immediately and repeatedly contacted the chief minister's office and conveyed a message not to proceed with the visit". Mr Osman's action resulted in the postponement of the Jan 14 meeting of the Joint Ministerial Committee for Iskandar Malaysia, as Singapore said the intrusion made the bilateral talks "untenable". The chief minister also sits on the panel. Malaysian Prime Minister Mahathir Mohamad on Friday also confirmed that "the Menteri Besar went without our permission", adding that "he thought it was Johor waters, that's why he went there". Dr Mahathir described Singapore's reaction as quite severe, "as if you are going to war". "I mean he is going to go in a ship into neutral water," he said. "It is not Singapore water either, it is international water and the Menteri Besar can go into international water without Singapore sending warships to chase him away," he said in reply to a question during a dialogue at the prestigious Oxford Union in Britain. Malaysia had, on Oct 25, unilaterally extended the Johor Baru port limits "into what are indisputably Singapore territorial waters", Dr Balakrishnan told Parliament last Monday. The extension, he said, goes beyond even the territorial sea claims in Malaysia's 1979 map, which Singapore has rejected consistently. KOTA TINGGI • Johor Menteri Besar Osman Sapian said he does not need the "blessing" of Malaysia's Foreign Ministry to carry out his duties as the state's chief minister, as he defended himself for making a visit on Jan 9 to waters off Tuas. 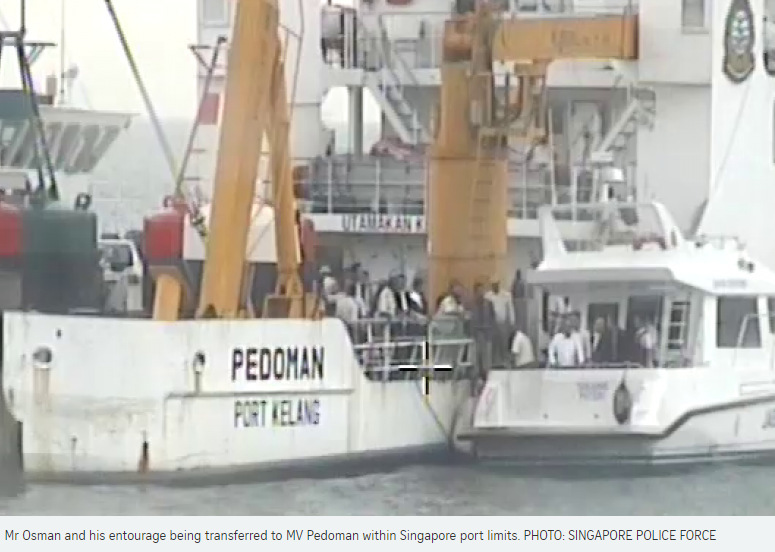 Malaysia's Foreign Ministry in a statement on Friday denied that Foreign Minister Saifuddin Abdullah had given Datuk Osman his "unofficial blessing" to board MV Pedoman, a Malaysian Marine Department vessel anchored off Tuas, in what Malaysia claims is its territory under Johor Baru port. Singapore, on the other hand, has asserted that the area is part of its territorial waters. Mr Osman said yesterday: "I have said it earlier, and I will say it again. 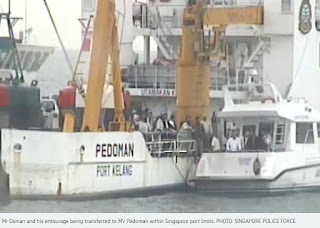 My visit to MV Pedoman was because the crewmen had been there for more than a month. "I was acting in my capacity as the state leader and the visit was within Johor waters even though the Foreign Ministry claimed that it did not have their blessing. "Let's say, if I wanted to make a visit within the Johor district, do I need permission from the Home Ministry?" On Thursday, Mr Osman claimed that he had the "unofficial blessing" of Datuk Saifuddin to board the vessel. But Malaysia's Foreign Ministry denied approving his trip, saying on Friday that "upon learning of the planned visit from a Malaysian enforcement agency on the morning of Jan 9 itself", it "immediately and repeatedly contacted the chief minister's office and conveyed a message not to proceed with the visit". Mr Osman's action resulted in the postponement of the Jan 14 meeting of the Joint Ministerial Committee for Iskandar Malaysia, as Singapore said that the intrusion made holding the bilateral talks "untenable". The Menteri Besar also sits on the panel. Malaysian Prime Minister Mahathir Mohamad also confirmed on Friday that "the Menteri Besar went without our permission", adding that "he thought it was Johor waters, that's why he went there". Tun Dr Mahathir described Singapore's reaction as quite severe, "as if you are going to war". The Malaysian Foreign Ministry said the two countries will discuss bilateral maritime issues on Jan 28. Officials will discuss airspace concerns in the "coming weeks", including the Instrument Landing System and approach procedures for Seletar Airport. Singapore and Malaysia are "making headway" and communicating over the ongoing maritime and airspace disputes. At the same time, Singapore's security agencies are "ever vigilant", said Defence Minister Ng Eng Hen. Dr Ng told Channel NewsAsia on the sidelines of an active living event yesterday: "I think we are making headway. As you know, the Minister for Transport and the Minister for Foreign Affairs and the (Malaysian) officials are speaking. "At the same time, our security agencies (the Singapore Armed Forces and the Home Team) are ever vigilant. We watch very carefully. We know what's going on. We're able to respond very quickly." Dr Ng said that it is now up to diplomats to arrive at a "constructive position", adding: "We'll leave it to the Ministry of Foreign Affairs, but I think both sides have stated their views so let's let our diplomats and officials talk it through and arrive at a constructive position that respects both sides' rights, goes (in accordance) with international law as well as helps both sides prosper." He noted: "Ultimately, we lead our individual countries but we are servants to our people, and we must make sure our people are not put into harm's way and that their livelihoods are not affected. "At the same time, guarding our own rights (based) upon international law and I think based on that, there are common views that both sides can arrive at that will meet our objectives. That's the best way to serve our people." Dr Ng said the most important takeaway is that "we have avoided coming to blows". He added: "It's always better to settle disagreements through peaceful talks, negotiations and discussions." Singapore disputes Malaysia's claim that the new Instrument Landing System (ILS) and ILS approach procedures for Singapore's Seletar Airport will affect the development of Pasir Gudang town in Johor. The two countries are also entangled in a maritime dispute following Malaysia's decision to expand Johor Baru's port limits. The issue was escalated when Malaysian government vessels moved into Singapore waters. Officials from the two countries will meet in the coming weeks to discuss the ongoing disputes. Singapore is seeking to extend a mutual one-month suspension of two measures while it thrashes out airspace issues with Malaysia. Transport Minister Khaw Boon Wan sought to extend the suspension of Malaysia's restricted area over Pasir Gudang and new landing procedures at Seletar Airport to give officials "more discussion time to reach a win-win outcome". Mr Khaw said that he made this proposal to his Malaysian counterpart Anthony Loke, whom he met in Singapore for a "heart-to-heart discussion". "He will take my suggestion back to his Cabinet colleagues," Mr Khaw said in a Facebook post yesterday. Also writing on Facebook, Mr Loke said that he had a "fruitful and constructive meeting" with Mr Khaw. "We agreed on the way forward to solve the Seletar Airport issue, and the civil aviation authorities of both countries will continue the discussion on the technical aspects," he added. This is the third time that the two ministers have met, after previous meetings in Putrajaya, Malaysia, and Bangkok last year. They will meet again after Chinese New Year to continue the discussion over airspace, Mr Khaw said. Singapore and Malaysia are embroiled in a dispute over the Republic's introduction of an Instrument Landing System (ILS) for Seletar Airport and Malaysia's subsequent decision to declare a restricted zone over Pasir Gudang for the purpose of military activities. On Jan 8, both countries agreed to simultaneously and immediately suspend - for one month in the first instance - the restricted area and the ILS for Seletar. The agreement was reached at a meeting between Foreign Minister Vivian Balakrishnan and his Malaysian counterpart Saifuddin Abdullah in Singapore. Malaysia claims that an ILS at Seletar Airport would hamper the construction of tall buildings at Johor's Pasir Gudang, to the north of the airport. Singapore has said repeatedly that this is not true as the new landing system does not impose new height restrictions. The only change on introducing an ILS is that pilots will be guided using ground instruments so that they no longer have to rely on just their vision. On Dec 25, Malaysia declared a restricted area over Pasir Gudang, which was in the flight path for landing and take-off at Singapore's Seletar Airport, from the north. It meant that all planes heading to and from Seletar would need prior approval from the Royal Malaysian Air Force to operate in that zone between 2,000 ft and 5,000 ft, or avoid the area. The Singapore-Malaysia airspace dispute surfaced publicly on Nov 23, when Malaysian carrier Firefly said it would suspend all flights to Singapore from Dec 1, the day it was supposed to move its operations from Changi Airport to Seletar. It was later revealed that this was because the airline had not received the green light from Malaysia's aviation regulator. In a recent statement in Parliament, Dr Balakrishnan said: "Ironically, CAAS (Civil Aviation Authority of Singapore) was trying to facilitate Firefly's operations at Seletar by installing the ILS, which Malaysia has now objected to." The disagreement over flight procedures for Seletar Airport is part of a larger air dispute that also includes Malaysia wanting to take back management of airspace over south Johor, a task that was delegated to Singapore in 1974. Singapore and Malaysia are also locked in a maritime dispute, sparked by Malaysia's unilateral decision to extend the Johor Baru port limits in October, and subsequent intrusions by Malaysian government vessels into Singapore waters. Our political leaders may have misread Malaysian Prime Minister Mahathir Mohamad. The man interprets restraint as contemptible weakness to be trampled over. He only understands, indeed respects, strength. The only way to bring him back to reality is to respond to every provocation of his in kind, while taking care not to initiate any on our own. Hence we should immediately and unilaterally extend the Tuas port limits beyond the 1979 Malaysian claim line, to the same extent as the Johor port limits have been unilaterally extended beyond the line. We should then anchor the same number of Singapore government vessels in the waters beyond the line as the number of Malaysian government vessels that have been anchored in our waters. We will increase or reduce this number in accordance with the number of Malaysian vessels in our waters. Our enforcement agencies should stand by to take the same action against the Malaysian vessels as whatever action that may be taken by the Malaysian authorities against our vessels. For good measure, one of our ministers can visit our vessels to see how our security forces are carrying out their duties, in the belief that he or she is in our waters. What if the second-time Malaysian prime minister initiates further provocations, like banning all export of food to Singapore? Our government will have failed us if it has not had a food security contingency plan in place for such a scenario. So that would be as good a time as any to put the plan to the test. How about the ultimate provocation: water? That question has been answered by our late founding prime minister and his answer is as valid now as when it was first given. To fellow Singaporeans who find me reckless, irresponsible or naive, I invite them to ask themselves this question: When push comes to shove, are we 100 per cent certain that we will not blink first? Whether we like it or not, our neighbours will always tempt us with this question and will continue to do so for as long as they are not completely sure of our answer. As long as we ourselves have the slightest lingering doubt about our answer, we will never be a truly sovereign nation that can stand straight among our neighbours. We and our children will forever be subservient to their wishes, even if such servitude is subtle and only infrequently enforced. The collision between Greece-registered bulk carrier Piraeus and Malaysian vessel Polaris happened at 2.28pm as the Piraes was on its way from Singapore to its next port of call at Tanjung Pelepas in Johor. An MPA spokesman said there were no reports of an oil leak. MPA is investigating the incident. Polaris, a Malaysian Marine Department vessel, is one of the vessels that trespassed on Singapore waters off Tuas last year. When contacted, the department's director-general Baharin Abdul Hamid said the Polaris was anchored and the Piraes was on its way when the vessels collided. Malaysia's Ministry of Foreign Affairs added that the vessels were in communication and Piraes had responded that it would steer clear of Polaris. "Despite the clear communication and definitive instructions given, the collision happened... and both vessels were cleared of each other at 2.36pm." The ministry added that there were no injuries to the crew of both vessels and the Piraes was instructed to sail to the Port of Tanjung Pelepas where it is moored now. Piraes and its crew have been detained by the Malaysian authorities for a preliminary inquiry. This is the first reported collision since Malaysia unilaterally gazetted altered port limits on Oct 25 last year. The new limits went beyond its past claims. In response, Singapore extended its port limits off Tuas to the full extent of its territorial waters. Speaking in Parliament on Jan 14, Foreign Minister Vivian Balakrishnan said Singapore would do its best to discuss all outstanding bilateral issues with Malaysia in a calm, reasonable and focused manner. He added that his discussions with his Malaysian counterpart have been "amicable and constructive, focused on trying to resolve the issues". Officials from both countries have been meeting to discuss both the maritime issue and a separate aviation dispute. Pireas had been refuelling at Singapore's eastern bunkering anchorage, which lies south of Bedok. After doing so, it informed MPA that it was headed for Tanjung Pelepas in Johor, said the authority. At 1.55pm, Pireas entered Singapore's port limits off Tuas. "It then slowed down, changed direction and collided with Polaris," MPA said. The accident happened at around 2.30pm. Upon establishing contact with Pireas, MPA's Port Operations Control Centre instructed the Greece-registered vessel to stay clear of the area, MPA said. "At this point, Pireas reported that prior to contacting (the control centre), it had collided with Polaris and there was no damage to its vessel." The crew members of both vessels were not injured. Malaysia's Ministry of Foreign Affairs said on Saturday night that the Greek vessel and its crew have been detained. As Saturday's accident occurred in Singapore's territorial waters, MPA launched investigations immediately, it said. It has sent official notifications to Malaysia's Marine Department and Greece's Hellenic Bureau for Marine Casualties Investigation. It is also gathering and reviewing information - such as vessel records and video footage of the collision - and has requested a formal incident report from both vessels. MPA has also contacted the Greek vessel's agent in Singapore to assist with investigations. "We advise the shipping community to ensure that vessels operating within Singapore Port Limits comply with the applicable regulations, including reporting their movements and to anchor only within designated anchorages," it said. Singapore "will not allow any foreign government to assert any authority in our waters", Foreign Minister Vivian Balakrishnan said in a strongly worded statement in Parliament yesterday. "If there are any attempts to assert authority or take any unauthorised actions, our agencies, our vessels and our forces will take appropriate measures," he added. He was replying to Nominated MP Walter Theseira, who asked about a collision earlier this month between Malaysian government vessel Polaris and Greek-registered bulk carrier Pireas in Singapore's territorial waters off Tuas. Associate Professor Theseira also asked what measures can be taken to ensure that vessels, crew and passengers will not be subject to foreign authority while in Singapore territorial waters or for acts committed in Singapore territorial waters. The collision on Feb 9 took place as the Pireas was on its way from Singapore to its next port of call, Tanjung Pelepas in Johor. Dr Balakrishnan told the House that a Singapore Police Coast Guard vessel on site observed and recorded the collision. The Maritime and Port Authority of Singapore (MPA) was thus notified by the Maritime Security Task Force and the Pireas itself. And the MPA, having determined the incident was not a "very serious maritime casualty" under the International Maritime Organisation's code on casualties, allowed the vessel to proceed to its next port of call. The minister noted that Pireas was not detained by the Malaysian authorities in Singapore waters. Malaysia, on Oct 25 last year, unilaterally gazetted altered port limits that went beyond its past claims and intruded into Singapore's territorial waters. Malaysian government vessels have also continued to intrude into those waters. Singapore has called on Malaysia to withdraw its ships and return to the status quo before Oct 25. It has also extended its port limits off Tuas to the full extent of its territorial waters, and both countries are in talks on the matter. Prof Theseira also asked the minister what mariners should do if they were given instructions by Malaysian vessels in Singapore waters, and what Singapore forces would do if they were to observe such attempts to give instructions. Dr Balakrishnan said the waters have been designated as Singapore's port limits, hence, all vessels passing through should take instructions from MPA. "Any foreign government vessels have no locus standi to be issuing any instructions." A joint working group looking into the maritime border dispute between Singapore and Malaysia will submit its recommendations to the foreign ministers of the two countries early this month. In an update yesterday, Foreign Minister Vivian Balakrishnan said that officials have been meeting to discuss measures to de-escalate the situation on the ground, and are aware of the urgent need to prevent accidents and untoward incidents. Last month, the Greek-registered bulk carrier Pireas collided with Malaysian government vessel Polaris, which was anchored illegally in Singapore's territorial waters. Dr Balakrishnan told Parliament that while several issues with Malaysia have emerged in recent months, the Government is committed to resolving them in an "amicable and constructive manner, and in strict accordance with bilateral agreements and international law". Besides the maritime dispute, the two countries are in disagreement over Singapore's introduction of new landing procedures for Seletar Airport and Malaysia's subsequent decision to declare a restricted zone over Pasir Gudang for the purpose of military activities. Both countries have agreed to mutually suspend the measures until the end of this month. Yesterday, Mr Vikram Nair (Sembawang GRC) and Dr Muhammad Faishal Ibrahim (Nee Soon GRC) asked for updates on the disputes, during the debate on the budget of the Ministry of Foreign Affairs. On the landing procedures and airspace issues, Dr Balakrishnan said both sides' transport ministers and senior officials have been meeting to discuss the matters. "And again, we look forward to finding a solution that is mutually agreeable, and - fortunately or unfortunately - in my capacity as Acting Transport Minister, this is also my problem at this point in time," he added. Dr Balakrishnan is standing in for Mr Khaw Boon Wan, who underwent minor surgery for a fractured left arm yesterday morning. Senior Minister of State for Foreign Affairs Maliki Osman said in Malay: "As close neighbours, issues will naturally surface from time to time that we have to deal with. "What is important is how we deal with them - discussing in good faith, complying with international law and honouring existing agreements." He added: "Despite these current difficulties, Singapore still hopes to work with Malaysia for better relations, and for closer long-term cooperation that will benefit the citizens of both sides." Singapore and Malaysia yesterday agreed to jointly suspend overlapping port claims, saying this was vital to end a stand-off which has seen at least one collision in waters off Tuas since the dispute surfaced. A joint statement by Singapore's Foreign Minister Vivian Balakrishnan and his Malaysian counterpart Saifuddin Abdullah, after they met yesterday, said both countries will mutually suspend the implementation of their overlapping port limits with immediate effect. Malaysia and Singapore will instead return to their port limits prior to Oct 25 and Dec 6 last year, respectively, undoing the overlap, and as a step to start talks to delimit their maritime boundary in the area. The measures, both said, "demonstrate the commitment of both countries to work together to preserve a strong and positive bilateral relationship on the basis of equality and mutual respect, and to resolve bilateral issues amicably in accordance with international law". Malaysia had on Oct 25 gazetted an extension to the Johor Baru port limits beyond territorial claims made in its 1979 map, and anchored government vessels in the area. 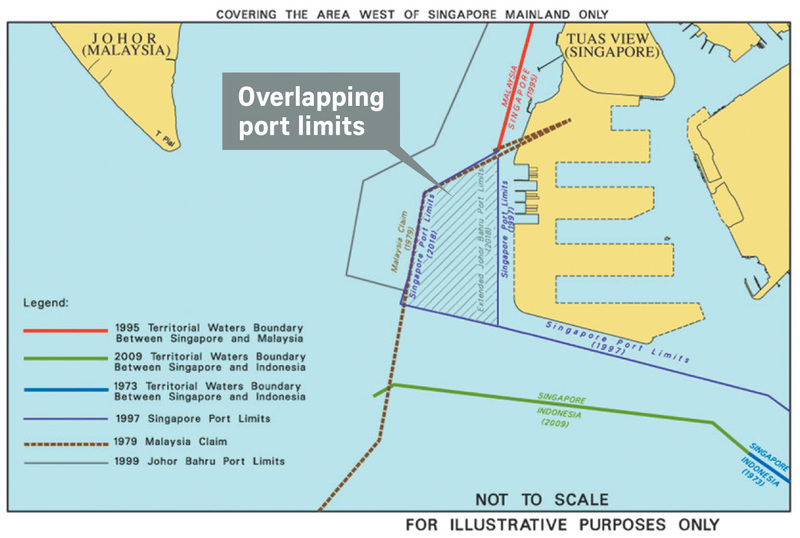 On Dec 6, Singapore extended its port limits to the extent of its territorial waters in response. Yesterday's meeting followed one by the ministers in Singapore on Jan 8 to de-escalate the situation and find a way forward to resolve the matter. • Set up a joint committee to ensure the first four measures are implemented within one month, and that talks to delimit maritime boundaries in the area start within a month after that. Dr Balakrishnan told Singapore media the agreement is "a very important first step" to resolve the issue. "Their ships would leave, the port limits will revert to the situation before Oct 25, and we will continue to patrol those areas in accordance with our laws and in accordance with Unclos. So there will be lowered risk of incidents," he said. "And then we can sit down, we can commence the process of negotiations for delimitation." The joint committee will be led by Singapore's Permanent Secretary for Foreign Affairs Chee Wee Kiong and Malaysia's Foreign Ministry Secretary-General Muhammad Shahrul Ikram Yaakob, who co-chaired the working group behind the recommendations. Datuk Saifuddin told a joint press conference "both countries have demonstrated a deep commitment to reach an amicable solution". Added Dr Balakrishnan: "All of these measures are going to be carried out without prejudice to our respective maritime boundary claims in the area." The joint statement also said that "in the event that the committee is unable to reach an amicable solution on delimitation, Malaysia and Singapore may mutually agree to resort to an appropriate international third-party dispute settlement procedure on terms to be mutually agreed by the parties". Both sides also discussed the 1962 Water Agreement. Their attorneys-general will continue discussions to better understand each other's position on the matter. Dr Balakrishnan also met Transport Minister Anthony Loke and Economic Affairs Minister Azmin Ali to discuss bilateral cooperation.